You’ve tried diet after diet. Most of them were just a quick fix. You’d lose weight and then a few months later it would be back. But then you heard about keto weight loss. Maybe you heard about it from a friend or on the internet or in the news. So you decided to give being a ketogenic woman a go. Welcome to the community! And, if you’re new to the community, or you are thinking, what is keto, then I should explain to your what keto is before we get started. Keto is a low-carb, high-fat eating style where we eat less carbohydrates than normal to slide into the metabolic state of nutritional ketosis (not to be confused with ketoacidosis). In this state, we are able to burn fat as fuel, regulate our hormones, and in the case of today’s blog post, lose weight! You should know something. Keto is not a one-size-fits-all diet. Depending on the individual, slight adjustments should be made and if you don’t make them, you could have trouble accomplishing your goal of losing weight. 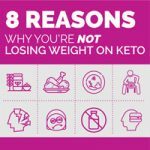 So here’s some keto help: 8 reasons why you’re having a hard time losing weight on keto, and how to fix it! A lot of women are just simply eating the wrong kind of carbs, which increases their total carbohydrate allotment unnecessarily. Carbohydrates in your favorite low-carb protein bar are very different from the carbohydrates in some of your favorite low-carb vegetables, like cauliflower, broccoli, or spinach. There’s something you need to know: Ketosis will not necessarily lead to weight loss. The reason for this is just a simple combination of math and basic nutrition. If you eat too many calories, you will not be able to lose weight—even if you dramatically decrease your carb intake. That being said, a well cared for metabolism is the key to health. And by eating too few calories, you could get yourself into trouble, too. Being on a keto weight loss plan does not mean you can just consume as much fat as you want. If you eat too much fat, you will create an extreme surplus of calories. The reason for this is that fat has more than double the calories of proteins or carbs—a pound of fat holds about 3,500 calories. So if you do the math, by cutting out 500 calories every day for a week, you’ll lose a pound of weight. The fact that fat contains so many calories is where it get messy, which is why it is necessary to count fat grams so that you can stay cognizant of your consumption. If you are a volume eater, meaning you like to feel full after you’ve eaten, don’t rely on fats to make you feel the fullness! Instead, add low-carb veggies like cucumber, celery, and iceberg lettuce into your meals to add bulk without the mega calorie hit. Loving this? We’re just scratching the surface here on what could be happening with your inability to lose weight on keto. Generally, the reason women aren’t able to lose weight on keto is due to a health imbalance of some sort. Perhaps you have thyroid imbalance, an autoimmune condition, or imbalanced hormones. 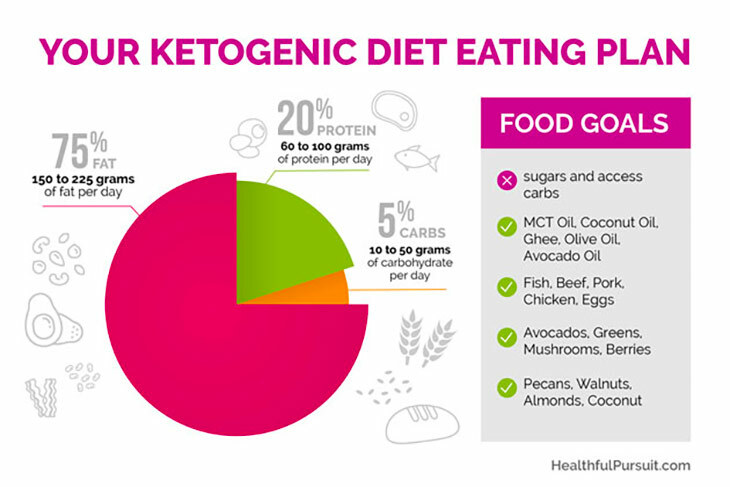 My 30-day program, Fat Fueled, provides women with a step-by-step guide on how to adjust the ketogenic diet to help balance issues that may be keeping our weight stuff. 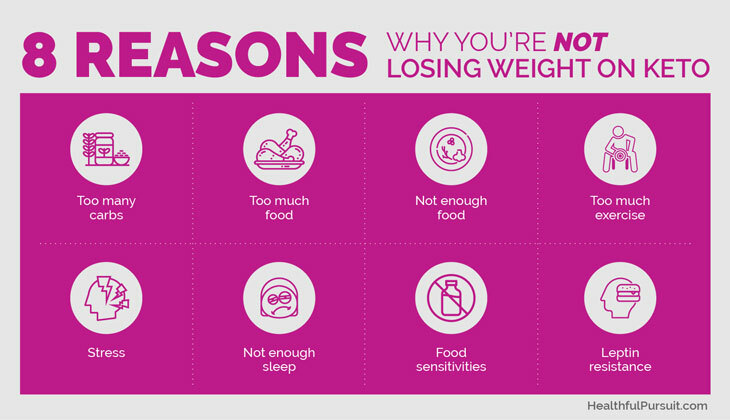 Just as eating too many calories will prevent you from losing weight, eating too few calories can do the same thing. You need to make sure that you eat enough calories so that your fat stores can cover the deficit you create by not consuming carbohydrates. If you fail to do this, your body will start to eat away at your lean mass in order to get the energy it needs to maintain its current state. When you eat too little and create a deficit that is too big, your metabolism will down-regulate to ensure that your body is able to function properly. Should consumption go too low, unnecessary things like maintaining a regular menstrual cycle is eliminated. This is when women have issues with their cycle in relation to a calorie deficit. Now don’t get me wrong. Exercise is one of the best things you can do for your body. It has been proven through study after study to improve your health in many different ways. Plus it makes us all feel good… but there is a limit. There are two reasons for this. The first is inflammation. While all forms of quality exercise will lead to some acute inflammation, over-exercise often leads to both oxidative stress and systemic, internal inflammation. The second reason chronic exercise isn’t a great idea is that if you’re overdoing exercise, it’s likely with cardio, or aerobic training. The problem with overdoing aerobic training is that it burns so many calories, making your body feel deprived and increasing your appetite. In the end, you’ll overeat to restore the calories back to your body—your willpower just can’t overpower your biology. High stress can often lead to issues with weight loss because of cortisol’s role in the body. This stress hormone is one of the hormones released when your body is under stress or in fight-or-flight mode. And because cortisol pushes your body to store fat around your stomach, when there is excess of the hormone your body will struggle with weight loss. Additionally, cortisol can force your brain to be under-fueled because it pushes glucose to the muscles instead of the brain when the body is stressed. Besides weight gain and keeping the brain from getting the energy it needs, cortisol can also lead to acne. Bummer, right? Now, don’t go thinking cortisol is evil. I know, I’ve painted that picture… but we DO need it to survive, to stay alert, motivated, and awake. The good news is that when your stress is under control, cortisol gets to do what it was meant to do, regulate our sleeping cycles, boost motivation, and be our friend throughout the day. It’s only when the hormone is overproduced that weight loss is hindered. And the even better news is that your hormones on keto are more regulated. This means that you can better manage stress and keep your cortisol levels in check while following a ketogenic diet. The reason for this is that the foods that are encouraged for keto women have anti-inflammatory properties, which help to reduce chronic cortisol levels and improve your sleep. Sleep is a tricky topic when it comes to how much or how little someone should get, but you do need to test out how much sleep your body needs–if you do not get enough, weight loss can be stalled or completely hindered. The reason that a lack of sleep can take such a toll on your body is that it messes with your body’s biological clock and your circadian rhythms. Your organs depend on these because they are set to understand and operate at different levels depending on the time. If you mess with your sleep schedule, they won’t operate at their optimum levels and maximum fat loss simply can’t be achieved. And then there’s hormone regulation, including the hormones that control your hunger. More specifically, two hunger hormones are negatively impacted by a lack of sleep. The first is ghrelin, which is the hormone that makes you feel hungry. Ghrelin levels are increased when you don’t get enough sleep. The second is leptin, which is the hormone that makes you feel full. Leptin levels are decreased when there is a lack of sleep. This combination leads to a struggle with weight loss. It is not uncommon to have a food sensitivity that you aren’t aware of. Oftentimes it is a sensitivity to dairy foods like cheese, cream, yogurt, and ghee. And recently, many people have become aware that they have a sensitivity to gluten. These sensitivities lead to problems with the gut and the gut imbalance then leads to inflammation. The inflammation can then turn into a handful of different chronic diseases, not to mention weight gain. So even if you are strict about tracking calories and following your macros, you still need to listen to your body. Experiment with different foods and see how different levels of various foods make you feel. I mentioned leptin above, but it needs a deeper explanation. It is the hormone that helps to control fat. Essentially, it sends a message to your brain when enough fat cells are present so that your brain knows when to stop eating. The hormone itself is produced by fat cells in your body and it plays a big role in calorie intake, calorie burning, and the amount of fat you store on your body. When your body becomes resistant to leptin, it stops the brain from receiving the message that there are enough fat cells. In other words, you won’t know when you’re full. 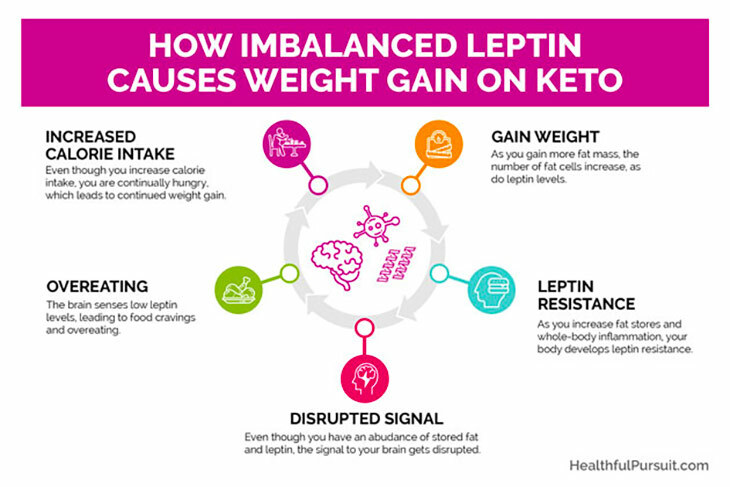 Reasons for leptin resistance include poor sleep patterns, the body being in starvation mode, a diet high in processed food, calorie restriction, overeating, and stress. Leptin resistance is a big reason that people with obesity struggle to lose weight—they have plenty of leptin, but their brain isn’t getting the signal so they never feel satiated. 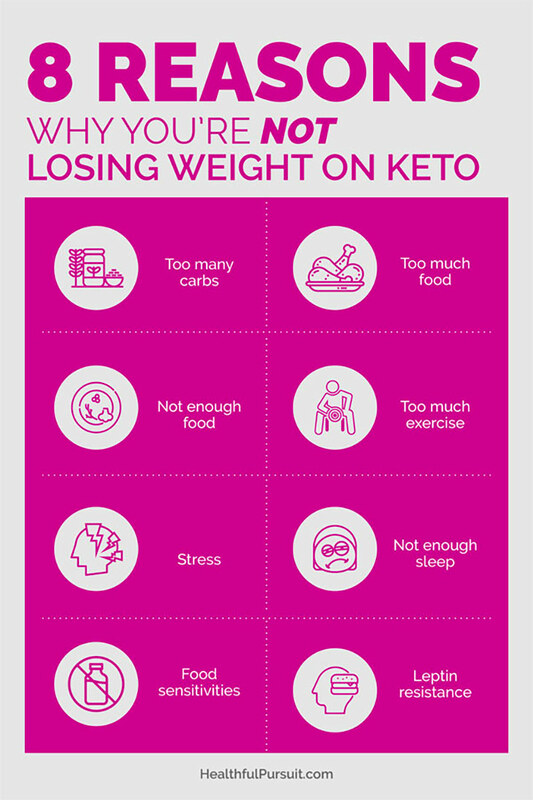 While all of these 8 issues could be the reason that you are struggling to lose weight with the ketogenic diet, you will need to narrow them down. To do this you should go through a trial and error process. Once you pinpoint the issue, you can begin to address it and watch as keto weight loss works for you. Have fun! And remember that your body is on your side.